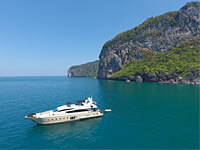 An overnight Phuket yacht charter is the ultimate getaway from all the hustle and bustle of daily life. With the option to set anchor wherever you like, it is you who decide how close, or how far away, from everybody else you want to be. 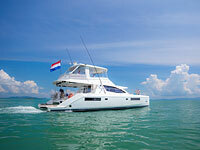 Phuket boat charter length depends on your mood and your appetite for adventure. A simple overnighter, or a cruise on a comfortable Phuket luxury yacht with your own hostess, cook and skipper, the Limestone Adventures team will arrange your dream holiday on the water. Highly skilled captains and crews will take you on stunning Phuket sail tours opening beautiful cruising areas for you and take you to hidden anchorages of your dreams. Be it a night of fun out at the lively beaches around Phi Phi Island or a quiet night under the stars, where the only thing you can hear is the gentle play of the waves touching the hull of the yacht, it is all your choice and well in reach. 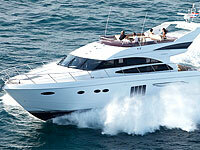 A fine Italian built sports yacht with high class fittings and equipment, a perfect day cruiser. Perfect yacht for extended overnight cruises, stylish sunset cruises or parties. The Bilgin 98 offers a fantastic fly-bridge with a Jacuzzi, barbecue, dining and sunbathing. This late 2011 model Princess P64 is a gorgeous British built yacht that makes her the flagship. 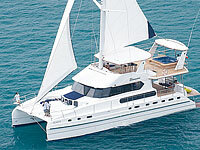 Some of our Phuket yachts are very well suited to cater for scuba diving, please inquire for more details. You see, the possibilities are endless and once we know more about what your cruising preferences are we can custom tailor you an itinerary which will suit you perfectly. Copyright 2019 by Sunshine Charter Ltd. All rights reserved. A great itinerary for a 3-4 day cruise would start with a visit to the truly amazing Phang Nga Bay. The magnificent limestone cliffs and islands offering spectacular views and the possibility to explore islands where nobody else will disturb you. Kayaking, swimming and exploring are the activities on offer. Spend the night at an anchorage near Koh Yao Noi with the option to dine at one of the excellent beach resorts or have your chef prepare dinner on board. Day 2: Wake up in the morning to the song of birds and the smell of freshly brewed coffee and enjoy a marvelous breakfast on board after which you refresh yourself with a splash into the ocean. Continue your cruise to Koh Hong Krabi, one of the lesser visited areas in the Bay with possibilities for snorkeling or just laze on one of the many hidden beaches there. After lunch you head for Phi Phi island, where you could even get onto the island at night for its buzzing nightlife to stretch your legs and enjoy perhaps a drink or two in one of the many pubs and bars along the beach. The great thing is then to escape to the peace and tranquility of your yacht when you had enough, just call your crew to pick you up with the tender. Day 3: After a hearty breakfast on board the yacht leaves for Koh Ha Yai enroute, where you can find a teeming coral reef with the best snorkeling places in the entire area. Spend a few hours there in the water and in the afternoon leave for your night anchorage at Koh Rok Nok. This is an unbelievable beautiful place for a night, staying between the two islands of Koh Rok Nok gives you the feeling of finally having found paradise on earth. The following day visit the Emerald caves at nearby Ko Muk. 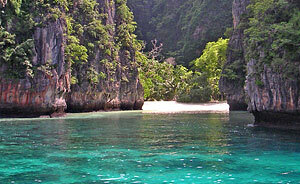 Have the crew take you close in the dinghy at low tide and visit the most amazing cave in the south of Thailand. If you plan to spend more days on board the route to the southern national park of Tarutao with many more islands and all the way to Langkawi, Malaysia, offers more places to discover than one can imagine. If scuba diving or snorkeling is your thing there are plenty of options. Already on the way to Phi Phi Island there are excellent dive sites such as the famous shark point, a submerged group of rocks where leopard sharks can be spotted regularly, then Phi Phi itself with a lot of smaller islets around it. To the western side of Phuket, and out into the Andaman Sea there are the Similan Islands, once recognized as amongst the top 10 dive sites in the world. The excellent snorkeling and scuba diving areas to be found around Phi Phi, southern islands and the Similans plus the magnificent limestone cliffs in the northern Phang Nga Bay which offer a truly breathtaking background for cruising will leave long lasting memories with you and your friends. contact us for your personalized itinerary, considering your preferences and the time of the year you are here.